What’s Changed With Dee Gordon? While I appreciate the lack of question mark at the end of the sentence — as it would’ve resulted in an uncouth double punctuation — it’s clearly a question about which this individual feels passionately and desires a sincere answer. After all, Dee Gordon is hitting .331/.364/.441 with 24 steals. He’s the number-one ranked second baseman in ESPN leagues and the number-three overall player, behind only the Colorado duo of Charlie Blackmon and Troy Tulowitzki. How the [insert choice expletive here] could I possibly rank Dee Gordon as a fourth-tier second baseman? If my tiered rankings merely sought to reflect what had happened throughout the first month-plus of the season, Dee Gordon would’ve clearly been a top-tier second baseman. However, I’m attempting to treat my tiered rankings as a forward-looking exercise, which means one thing regarding the 26-year-old second baseman: what’s changed? In other words, what reason do I have to believe Dee Gordon will continue to be a top-tier fantasy option and not revert to become the same guy who hit .256/.301/.312 over the previous three seasons (669 PA)? We can look at some standard peripheral numbers and understand nothing has changed much in terms of plate discipline. His 4.5% walk rate is lower than his career average and illustrates his free-swinging ways. However, he’s also making more contact than ever before. His 88.8% contact rate is the highest of his career and roughly equivalent to his contact rate in 2011, when he also hit over .300. But we also have to note he’s sporting a .388 BABIP, and no matter how fast one is on the basepaths, fantasy owners should expect that number to decline throughout the remainder of the season. Granted, declining to his career average of a .323 BABIP — which should be taken with a grain of salt because of the sample size — would approximately make him a .270-.275 hitter throughout the remainder of the year. With his stolen base totals, that’s not a throwaway batting average by any means. It’s just no longer elite. And if we’re talking about someone with a .270 batting average, lots of stolen bases, decent run totals, no power, and no runs batted in, we’re not talking about an elite fantasy second baseman. At the most, we’re talking about a second baseman who can carry a single category, but who is a serious liability in a couple others. With that in mind, I think placing him somewhere in the 8-to-12 range for second basemen throughout the rest of the season is fair. Digging deeper, I’m not convinced anything has significantly changed in terms of his approach and his ultimate outcomes. He’s hitting more ground balls and fewer fly balls, which is likely a positive development, but he’s still the same hitter he’s always been. Gordon used the whole field relatively well from 2011 to 2013, though he tended to pull the baseball on the infield and hit the ball to the opposite field in the outfield. Now, if we look at his spray chart from this season, we see the overarching trends remain static. 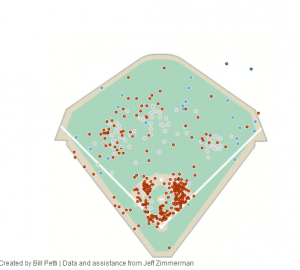 The most interesting aspect of the spray chart is the lack of hard-hit balls to right field. He has a couple deep to the gap in right-center, but to the dead-pull side, Gordon has hit three non-ground balls to right field. It’s great to use the opposite field, but that’s not the same thing as using the whole field. In other words, I’m not seeing anything markedly different in his spray chart than what we’ve seen over his previous three seasons in Los Angeles. With that said, there’s movement here. His plate discipline has improved slightly, though I do think too much is being made of this as it’s not significantly different than his plate discipline numbers from a year ago. He’s said to be making better overall contact with the baseball, which seems to ring true and can be seen in his career-high ISO of .110 and his career-high 24.3% line-drive rate. However, those are all slight movements. The biggest difference is the .388 BABIP, and I’m not sure we can throw that out the window because he’s made slight improvements in other areas. The overall hitting profile and plate discipline is similar, so at best, I’m only comfortable expecting him to be slightly better than his career numbers — which is why I’m suggesting a .270-to-.275 batting average going forward is reasonable to expect. Of course, Gordon could absolutely continue to outperform expectations. That’s always possible. When attempting to rank second basemen or attempting to project future performance, however, I’m not sure it’s helpful to assume overproduction. Fantasy owners also have to consider the fact that Alex Guerrero is also looming in the background at Triple-A. In limited work, he’s hitting .341/.398/.588 with four homers and a .247 ISO. If Dee Gordon does struggle for a significant stretch, it’s not difficult to see the contending Dodgers turn to Guerrero for increased offensive production. He signed a four-year, $28 million contract and is performing well in Triple-A. It won’t take much for him to get a chance, even if it’s simply splitting time with Gordon in some kind of pseudo-platoon role. That’s something else no one is talking about. Gordon is at the risk of becoming a straight-up platoon hitter at this point. I don’t want to place too much weight on such a small sample, but the difference is striking this year. The Dodgers are certainly not ignorant of this fact. If he begins to struggle over the next couple months — or if he simply continues to struggle this much against lefties — the organization could bring up Guerrero to be the second baseman against lefties. Gordon would still be the strong side of any platoon that could emerge, but such an arrangement would obviously be detrimental to any fantasy value. If I were to boil down this article into something more succinct, it’d be this: I’m not yet convinced Dee Gordon is anything significantly different than what we saw from 2011 to 2013, and he has competition standing tall behind him in Triple-A should he struggle for a stretch. I’m not going to rank a guy in the top-five when I’m not sold in the increased performance and when he’s not guaranteed the everyday role throughout the remainder of the season. That’s far from advocating for owners to sell on Dee Gordon. If I’m an owner searching for second base help on the trade market, though, I’m not going to be willing to meet the high price tag that it will inevitably require to acquire Gordon in a trade. I’m not counting out the 26-year-old speedster. I just have significant questions that are lingering, and that’s leading me to leave him ranked about 10th or 11th in my tiered rankings. We hoped you liked reading What’s Changed With Dee Gordon? by J.P. Breen! Dee is hitting negligibly fewer fly balls and negligibly more ground balls than his career averages (a few percentage points here and there). More than anything, this is probably just his BABIP regressing up to his true talent level (a mid-to-low .300s, let’s say) away from the sub-.300 nonsense from his “major league pitching is scary” period. 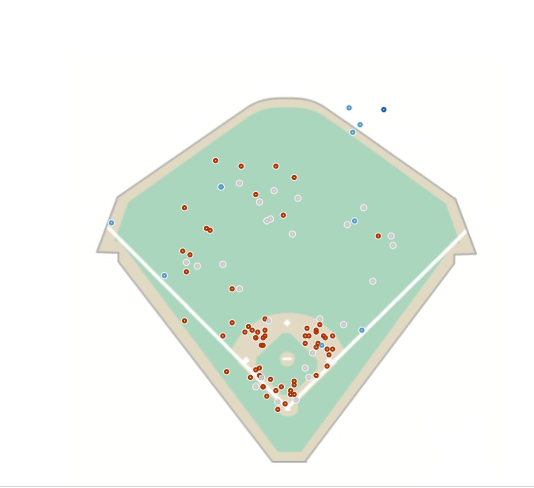 You’re assuming that this shift to ground balls from fly balls is something that a batter can do, and in particular that Gordon set out to do that and is succeeding at it. Another possibility is that this shift in batted ball outcomes is random variation that happens to falling in his favor at the moment. hitting ground balls instead of fly balls IS something that a batter can do. i’m simply giving him the benefit of the doubt that it is something he’s worked on in the offseason because that’s what i’ve read and heard and seen in the media leading up to the beginning of the season. he put on weight to help him with this as well. pitch selection. plate discipline and approach. these are all things he’s specifically been working on and that are visibly evident in how’s been playing thus far. Well if it’s not possible to hit more ground balls thru practice then Whitey Herzog wouldn’t have asked Ozzie Smith to do just that soon after coming to the Redbirds. Surely a HOF manager wouldn’t have asked a player to do something that was just random variance. The fact that he was able to lower his fly ball rate and increase his ground ball rate to take advantage of his speed should be evidence of that and I’m sure there are many other players you could find that have done this.